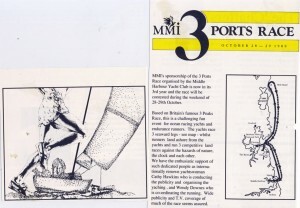 It could be said that planning for the inaugural MMI 3- Ports Circuit began over 5 years ago following the screening of a John Laws special on the British Three Peaks race. 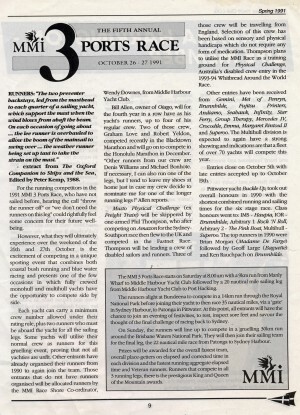 This event, now in its 11th year of staging, sets an awesome task for yachts crews, limited to five, which include two runners capable of running to, and scaling, the tallest three peaks in England, Scotland and Wales. 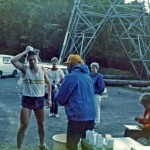 And to make life even more uncomfortable for the runners, the mountain peaks are subject to ice, rain, tog and snow. 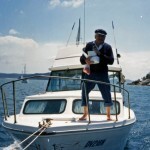 The yachtsmen too have to cope with being le aground as the tide recedes leaving them high and dry, not to mention the necessity to have to row their 36 foot yacht, when becalmed, for miles. Unfortunately, the proximity of tall mountains to the sea and, just as importantly, to each other, presented some challenges. 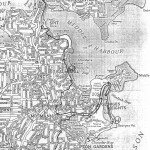 The most likely contenders, when Sydney's Middle Harbour Yacht Club looked at the proposal, being Yarrahappini near Port Stephens (in the north), and Pigeonhouse Mountain, inland from Ulladulla (in the south). 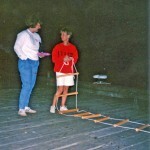 Human capabilities would be more than tested in either, let alone both mountains. 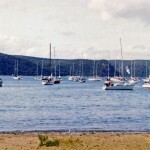 A combination of Pittwater, 20 miles north of Sydney, and Pigeonhouse was settled upon but, due to lack of interest by sponsors, the concept was shelved, although revived on two subsequent occasions when new sponsors expressed interest. 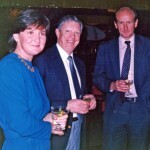 During the entire investigation and planning process, a close association developed with the organisers of the British Three Peaks event. 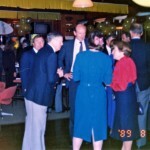 Firstly with the race's founding father, Dr. Robert Haworth, and then, a continuing contact with race organiser, Lt. Col. Colin Walker at Barmouth in Wales. 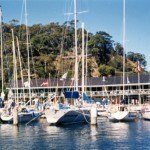 The development continued, with organisers at Middle Harbour Yacht Club looking to a tighter, although still challenging, schedule. 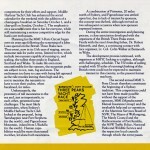 The 350 miles of sailing, coupled with 70 miles of running of the British event could not be expected to maintain interest in this country, so the present format was born. 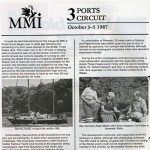 The MMI 3-Ports Circuit, commencing on October 3rd, 1987, therefore represents over 5 years of planning for this its initial staging. 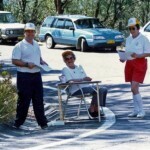 A staging which could not have beer contemplated without the support of the sponsors MMI, and the invaluable help and co-operation of the Maritime Services Board of NSW, the mayor of Wollongong and the people of Port Kembla, the NSW Traffic Police, National Parks and Wildlife Service and the respective local councils through which the event passes. 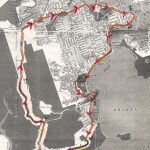 The MMI 3-Ports Circuit gets under way from the Spit Bridge, in the northern Sydney suburb of Mosman, with a road run through the streets to the Sydney Harbour Bridge. 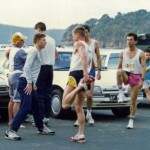 Then after crossing this famous landmark runners make their way along Circular Quay to the Opera House. 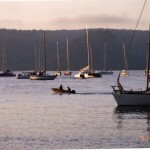 The first 15km run ends with runners being transferred to their yachts by dinghy for the 20 mile ocean voyage to the waters of Pittwater, north of Sydney. 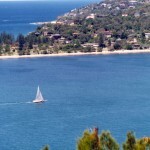 A view of Sydney's famous northern beaches is an added bonus on this leg of the race. 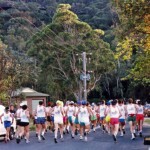 Arrival at The Basin on the western side of Pittwater, begins the runners' second challenge - up the service track in the picturesque Ku-ring-gai Chase National Park. 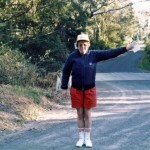 A chance to come to terms with nature, both fauna and flora, before a road run to West Head overlooking the expanse of water known as Broken Bay. No time for taking in the view as runners retrace their steps to their awaiting yachts. 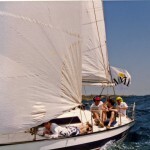 With runners aboard, it is time for the yachtsmen in the teams to show their wares, as they take on the longest sailing leg of the course, 70 miles to Port Kembla, passing Sydney Harbour and Australia's birthplace, Botany Bay en-route. 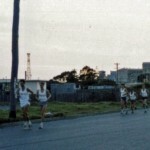 One of the industrial hearts of the State, Port Kembla is certain to turn on a warm welcome as the runners disembark their water transports for their last and hardest contest - a run through the streets of Port Kembla and on to Mount Kembla. 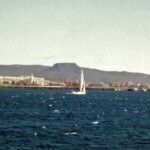 Recognised in the sea logs of early explorers, first by Cook in 1770, then by Flinders nearly 30 years later, as resembling the shape of a hat crown from the sea, Mt. 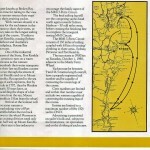 Kembla is 15km from the wharf. 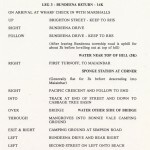 Arrival at the lookout will then present a testing forest maze for one runner to transgress to the summit, some 1.6km further on. 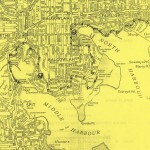 With a return journey to Port Kembla's outer harbour, the final leg commences. 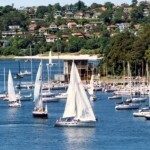 The final sailing leg will see the competing yachts headnorth again towards Sydney Harbour -- 50 odd miles away, before crossing the finishing line to complete the inaugural testing MMI circuit. 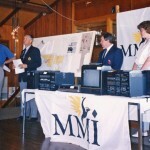 The years of preparation since the original concept came to the notice of Club officials, following the continued success of the British 3 Peaks race, were rewarded when the final yacht entered Sydney Harbour at the end of the inaugural MMI 3 Ports Circuit. 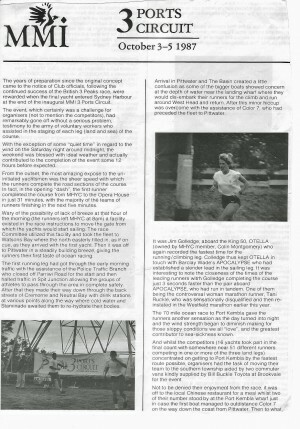 The event, which certainly was a challenge for organisers (not to mention the competitors), had remarkably gone off without a serious problem, testimony to the army of voluntary workers who assisted in the staging of each leg (land and sea) of the course. With the exception of some "quiet time" in regard to the wind on the Saturday night around midnight, the weekend was blessed with ideal weather and actually contributed to the completion of the event some 12 hours before expected. 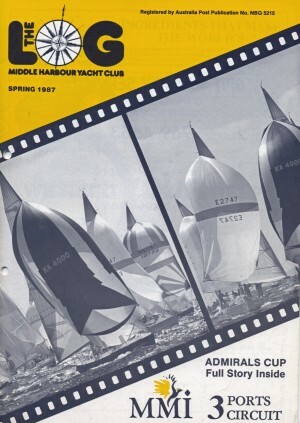 From the outset, the most amazing expose to the un-initiated yachtsmen was the sheer speed with which the runners complete the road sections of the course. 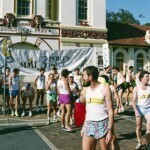 In fact, in the opening "dash", the first runner completed the course from MHYC to the Opera House in just 31 minutes, with the majority of the teams of runners finishing in the next five minutes. 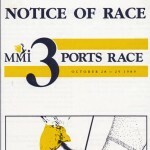 Wary of the possibility of lack of breeze at that hour of the morning (the runners left MHYC at 8am) a facility existed in the race instructions to move the gate from which the yachts would start sailing. 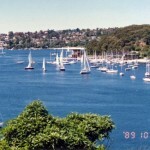 The race Committee utilized this facility and took the fleet to Watsons Bay where the north easterly filled in, as if on cue, as they arrived with the first yacht. 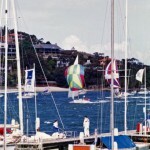 Then it was off to Pittwater in a steadily building breeze, giving the runners their first taste of ocean racing. 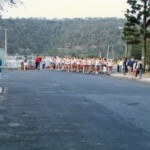 The first running leg had got through the early morning traffic with the assistance of the Police Traffic Branch who closed off Parriwi Road for the start and then halted traffic in Spit Junction allowing the groups of athletes to pass through the area in complete safety. 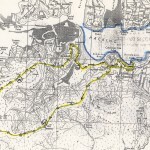 After that they made their way down through the back streets of Cremorne and Neutral Bay with drink stations at various points along the way where cold water and Staminade awaited them to re-hydrate their bodies. 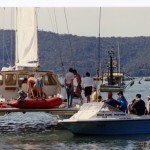 Arrival in Pittwater and The Basin created a little confusion as some of the bigger boats showed concern at the depth of water near the landing wharf where they would dis-embark their runners for the climb and run around West Head and return. 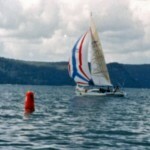 After this minor hiccup was overcome with the assistance of Color 7, who had preceded the fleet to Pittwater. 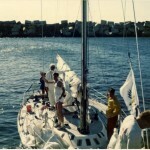 It was Jim Golledge, aboard the King 50, OTELLA (owned by MHYC member, Colin Montgomery) who again recorded the fastest time for the running/climbing leg. 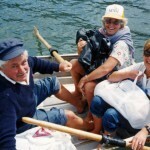 Colledge thus kept OTELLA in touch with Barclay Wade's APOCALYPSE who had established a slender lead in the sailing leg. lt was interesting to note the closeness of the times of the leading runners with Golledge completing the course just 3 seconds faster than the pair aboard APOCALYPSE, who had run in tandem. 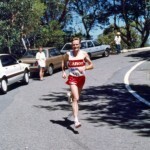 One of them being the controversial woman marathon runner, Tani Ruckle, who was sensationally disqualified and then re-instated in the Westfield marathon earlier this year. 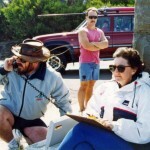 The 70 mile ocean race to Port Kembla gave the runners another sensation as the day turned into night and the wind strength began to diminish making for those sloppy conditions we all "love", and the greatest contributor to sea-sickness known. 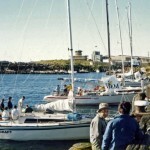 And whilst the competitors (16 yachts took part in the final count with somewhere near 51 different runners competing in one or more of the three land legs) concentrated on getting to Port Kembla by the fastest route possible, organisers had the task of moving their team to the southern township aided by two commuter vans kindly supplied by Bill Buckle Toyota at Brookvale for the event. 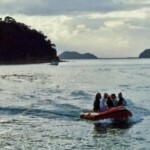 Not to be denied their enjoyment from the race, it was off to the local Chinese restaurant for a meal whilst two of their number stood by at the Port Kembla wharf just in case the first boat managed to outdistance Color 7 on the way down the coast from Pittwater. 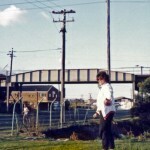 Then to what some described as Port Kembla's "Fawlty Towers" for a rest before the 4.30am early morning call to man the checkpoints for the land leg to Mount Kembla and return. 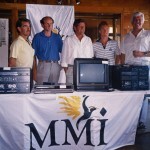 'Meanwhile, back at the Port Kembla wharf, Color 7 had arrived and so had local TV station cameramen from WIN 4, anxious to record the colour of the night arrival of the yachts. 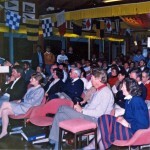 The subsequent arrival of the leaders saw the dock area lit up like a Christmas Tree by the strong TV lights resembling something akin to the finish of a Hobart race in constitution Dock. 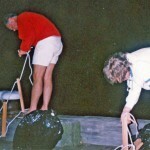 The rope ladders (which had to be made by organisers prior to the race as there didn't seem to be a supplier anywhere in Sydney) provided some comic relief as the silver rope showed some stretch as the Committee boat gave them the first test. 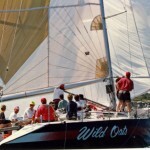 Then they got some more work as anxious runners were quick to make an escape to solid ground after their new found experience in an ocean racer. Master of ceremonies, "Munno", took over the entertainment department on the Port Kembla wharf asthe fleet filtered in - first Apocalypse, then Otella, thenan amazing site as the King 40 footer, TOCATTA displayed a result which could have had something to do with owner, Kanga Birtles, local knowledge of the area being South Coast boy from way back. 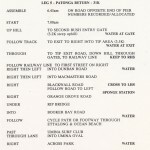 Organisers wisely had decided to delay the Port Kembla running leg until daybreak should the yachts arrive during the hours of darkness and it was tentatively set for 5.30am the next morning - a mass start for those runners from boats which had arrived in Port Kembla by that time. 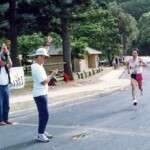 As it turned out, all but three of the fleet completed their task and 26 runners took off on the 30 kilometre run to Mount Kembla and back, the longest and most testing of the three running legs of the race. 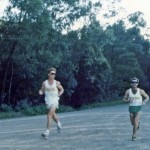 And this leg was to prove the most sensational of all when firstly Tani Ruckle fighting for second spot in the race missed the turning back into the Port Kembla wharf, taking two other competitors on the wrong course with her. A distressed trio found the Port Kembla Police Station where helpful officers directed them back to the right road. In the process the three had lost some time and a couple of places to boot. 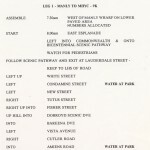 Secondly, one of the Army runners competing on the Newcastle entry, ALI BABA, collapsed when just three kilometres from the finish, having to be revived by his partner. A quick trip to the local hospital, a diagnosis of de-hydration (despite the many drink stations along the way), an overnight stay in the hospital and he was pronounced as satisfactory. 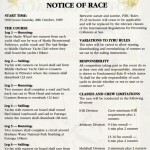 But certainly a scare for organisers, not used to this sort of occurrence, and a lesson for the future races. 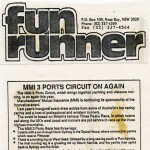 APOCALYPSE was to lead the fleet back through Sydney Heads on Sunday afternoon taking just over 30 hours to complete the three running and three sailing legs which made up the challenging inaugural MMI 3Ports Circuit. Not far behind was OTELLA who had to stage a gallant fight to not only overhaul the leader but make up for the time adjustment from the previous sailing leg. 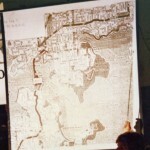 After this time was adjusted the margin was 36 minutes. Third in came TOCATTA, giving it victory in its division. 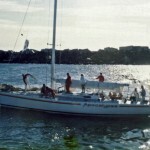 Division winners included Apocalypse and Tocatta, Peter Wheeler's GROUP THERAPY, the usually short-handed sailor Malcolm Jack in AUSSIE SPIRIT, Peter Nicholson's SEAQUESTA, re-named OCCIDENTAL LIFE for the race by his sponsor, and David Lee's Farr 1020, BITTER END. 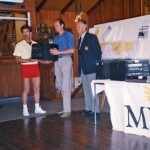 For the winners, keeping the philosophy of MHYC's recognition of the crew contribution, all members of each division winning boat received a special embroidered Bonds Grand Slam T-shirt showing their victory. 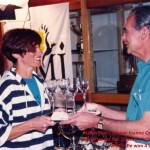 The post mortem celebration, after the race, saw each winning yacht presented with their spoils, a special present to the two lady runners who took on the torturous Mt. 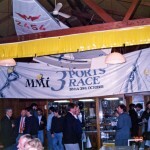 Kembla leg, champagne to help celebrate the occasion, and following speeches by Purdey Murn from MMI and Commodore, Ken White, a well-received gesture by the race sponsors - a FREE bar for the next hour and a half. 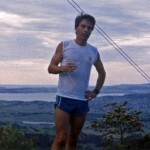 Most gratifying to organisers was the high praise from the running fraternity who took part in this, the Club's inaugural venture into this foreign field. 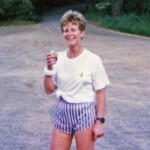 Praise for the manner in which drink stations were situated and, surprisingly suggesting a tougher course for next year. 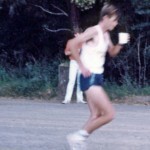 Main reason for this comment it would seem, was that the majority of runners who took part were within the top 100 in the State and their enthusiasm suggested that ever more would be along in 1988. 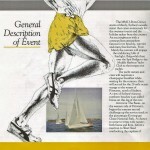 Truth of the matter is, the "average" runners wanted at least one orienteering type leg to ensure they managed to get a berth on one of the boats. 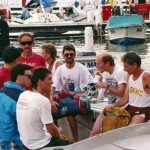 From the conversations which were forthcoming after the race, greatest apathy amongst yacht owners was the tear of being unable to attract two or more runners for their crews. 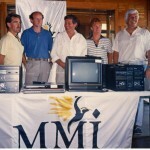 Ironically, in 1988, it seems the opposite may be the norm, with a surplus of runners looking for yachts. 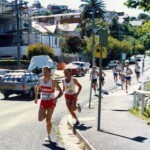 The event has, since its staging, created a great deal of interest within the running community, some going as tar to suggest that it would become more important than the City to Surf in their eyes. 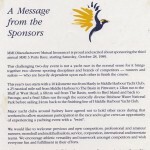 The sponsors, for their part, were more than happy and "look forward to a continuing association with MHYC...." wishing to reiterate our commitment to be involved again in sponsorship of the 3 Ports Race (in 1988)". 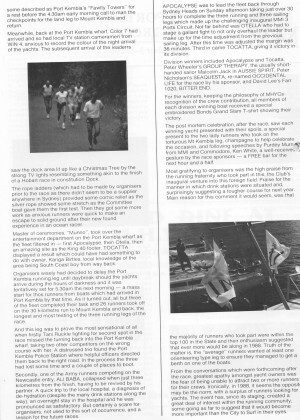 Finally, not withstanding all the preparatory work which preceded the weekend, the event could not have been as successful as it was (especially considering the venturing into such an unknown dimension as road running) had it not been for the un-selfish commitment of the army of voluntary officials and helpers who manned Color 7 for the weekend and the checkpoints in Sydney, Pittwater and Port Kembla. 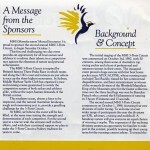 Special thanks to Hugh Wheeler, Bob Thorsby and lan Alfonso, Charlie Herbert and Peter Ziems on Color 7; John & Pat Skalla, Alan Sweeney; Steve Perks, Ross Adams, Marian Packer, Escu Davies, Karin Ovari, Frank & Jean Likely in the control vehicles; Terry Fitzgerald and George Canfield in the tenders; Andy & Jenny Brennan and their yacht crew at Pittwater; Geoff & Peggy Foster, Keith & Judy Tierney, Alan Patterson, Anton Hawkins, Harry & Val Packer, David Hocking, Ross Munn, Ken & Pauline Mascord, Tony Hill & Frank Martin. 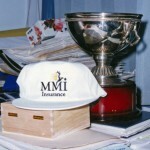 MMI (Manufacturers Mutual Insurance) is continuing its sponsorship of the innovative event based on Britain's famous Three Peaks race, in which teams sail along the UK's west coast and runners are put ashore to race up the three highest mountains. 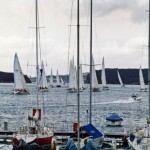 The race will be both Saturday and Sunday during the 1st October long weekend and is being organised by Middle Harbour Yacht Club. 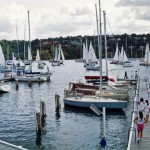 The CYC and Royal Prince Alfred Yacht Club have posted the race on their calendars and there are no conflicting sailing events in Sydney that weekend. 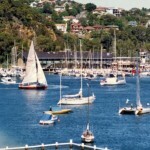 The race begins with a run through Manly to Middle Harbour Yacht Club where runners join yachts which race to Pittwater. 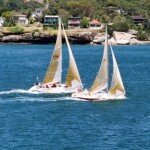 There is a running leg up West Head followed by a long sea leg south to Port Kembla, with a run up to Mt Kembla, then the yachts sprint back to Sydney and the finish. 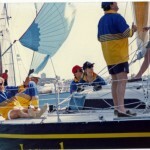 Each yacht has a minimum of two runners - although last year some of the bigger boats took teams of runners and interchanged them on different legs. 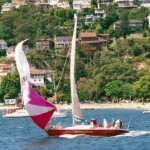 Last year's entries were some of Australia's top racing yachts and a host of professional and amateur runners. 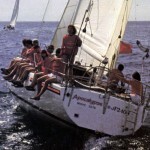 First boat home was pocket maxi Apocalypse, whose running team included Tani Ruckle who was involved in controversy prior to the MM! 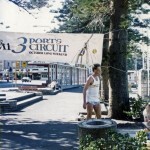 3-Ports Circuit when she was disqualified, and later reinstated, as winner of the women's division of the Westfield Marathon. 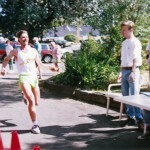 The event recognises individual running performances too. 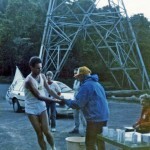 The King of the Mountain prize for the fastest collective time over the three land legs was won by Brandon Pietzch who covered the 63 kilometres of running in 3 hours 15 minutes and 13 seconds. 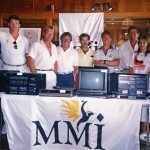 According to MMl's Marketing Manager Barry Dailey, last year's success indicates that owners believe the offshore yachting scene needs a novelty event like this to break up the highly competitive around-the-buoys racing each weekend. 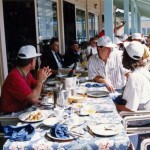 This year more effort will be put into the social side of the event. 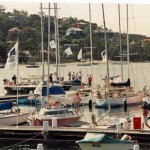 Activities organised by Middle Harbour Yacht Club include a champagne breakfast to send off the runners on the morning of 1st October, and char-grill on Sunday aftemoon 2nd October, as the boats finish. 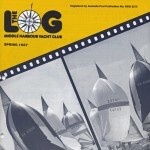 Entries can be obtained from: Middle Harbour Yacht Club, P0 Box 404, Spit Junction; New South. 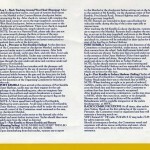 Wales 2088; telephone: 969 1244. 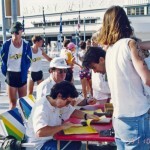 The club will also run a register of runners for those skippers who may need assistance in contacting athletes for their crew. 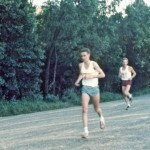 For the average sports lover it is hard to understand the connection between pistol shooting and cross-country skiing. 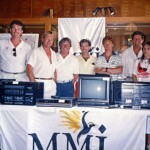 Or why it is necessary for an athlete to cycle, swim, fence, run and ride a horse to win one event. 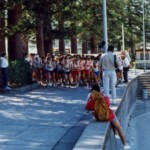 Nevertheless, the biathlon and modem pentathlon are Olympic events requiring highly skilled athletes to excel in diverse sports. 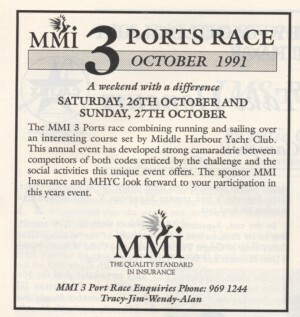 Far removed from the Olympic arena but in the same vein as such similar disciplines, Sydney has the MMI 3-Ports Circuit starting this Saturday. 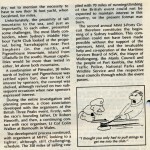 A curious combination of yachting and running, the 3-Ports Circuit was dreamed up by Frank Martin, former sailing secretary of Middle Harbour Yacht Club, who based it on a similar event held in Britain. 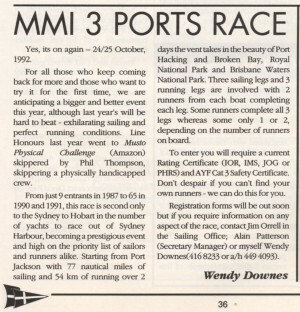 In the inaugural 3-Ports Circuit last year 38 runners negotiated Sydney traffic from the Spit Bridge at Mosman to the Opera House, where they were picked up by the 19 yachts in the fleet. 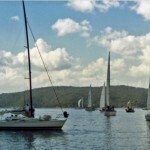 After sailing to The Basin, at Pittwater, the runners were put ashore for the 15km course around West Head. 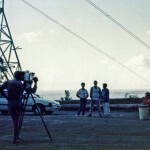 West Head. 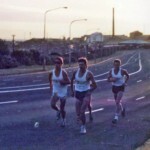 Then it was off to Port Kembla for the most arduous section of the event, the 30km climb and run no Mount Kembla. 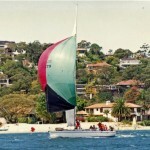 The winner of last year's race, Barclay Wade's Apocalypse, sailed into Sydney Harbour with an aggregate sailing/running time of 3 hr 22min 32s. 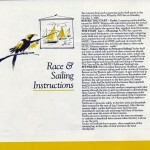 According to Wade, he liked the race because it was different from normal sailing. "I loved it. There was so much variation," Wade said. 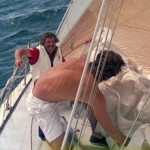 "Sailing can get very boring." 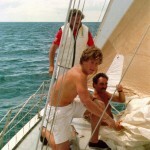 The race certainly wasn't boring for one of his running crew, Glen McConnell, who was violently seasick during the ocean stretches. 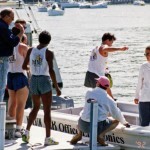 "A lot of the runners got seasick," Wade said. "But they ran anyway." 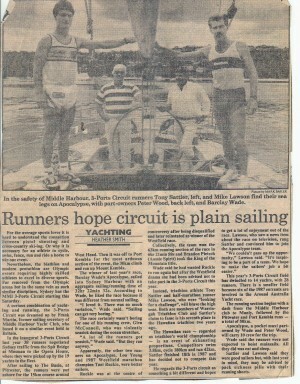 "
Apparently, the other two runners on Apocalypse, Lou Young and 1987 Westfield marathon champion Tani Ruckle, were better sailors. 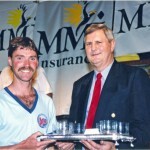 Ruckle was at the centre of controversy after being disqualified and later reinstated as winner of the Westfield race. Collectively, the team won the 63km running section of the race in 6hr 21min 58s and Brandon Pietzch (Aussie Spirit) took the King of the Mountain title. Wade said he had wanted Ruckle to run again but after the Westfield drama she had been advised not to take part in the 3-Ports Circuit this year. Instead, triathlon athlete Tony Sattler and half-marathon runner Mike Lawson, who were "looking for a challenge", will brave the high 'seas. 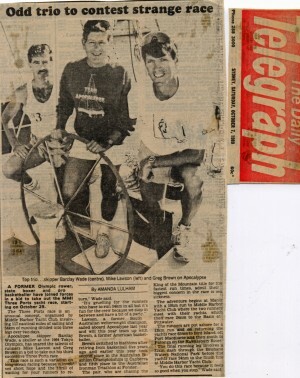 Both are members of 'Warringah Triathlon Club and Sattler's claim to fame is his seventh place in the Hawaiian triathlon two years ago. 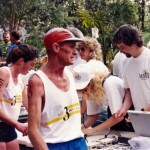 The Hawaiian race - regarded as triathlon's world championship - is an event of exhausting proportions. Competitors swim 3.8km, cycle l80km and run 42km. 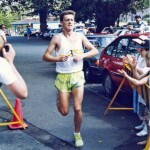 Sattler finished 18th in 1987 and has decided not to compete this year. 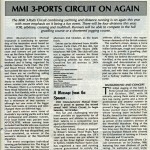 He regards the 3-Ports circuit as something a bit different and hopes to get a lot of enjoyment out of the race. 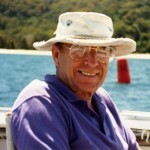 Lawson, who saw a news item about the race on television, rang Sattler and convinced him to join the Apocalypse team. "We couldn't pass up the opportunity," Lawson said. "It's inspiring to be a part of a team. 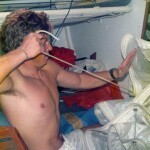 We hope to make the sailors' job a bit easier." 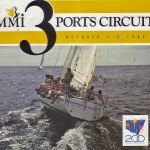 This year's 3-Ports Circuit field has dwindled to 14 yachts, with 28 runners. 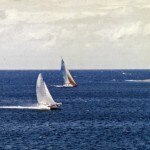 There is a smaller field because six of the 1987 entrants are involved in the Around Australia Yacht race. 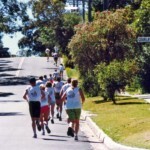 The running section begins with a dash from the Middle Harbour club to Manly, followed by the Pittwater and Port Kembla runs - a total of 58km. 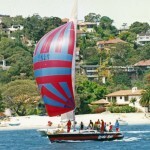 Apocalypse, a pocket maxi part-owned by Wade and Peter Wood, will carry 10 crew for the trip. 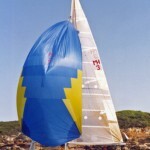 Wade said the runners were not expected to hoist mainsails. All they did was eat and sleep. 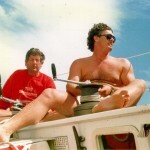 Sattler and Lawson said they were good sailors but, with last year in mind, they may be advised, to pack sickness pills with their running shorts. 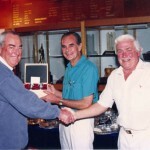 Winners - Apocalypse, Barclay Wade and Peter Wood. 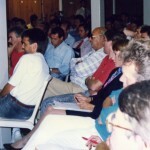 3 Ports Race (1988) - Winners Apocalypse. 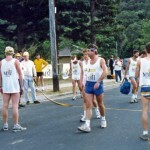 * Leg 1 - started in Manly, with runners running from Manly to MHYC. 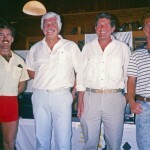 A former Olympic rower, state boxer and pro basketballer have joined forces in a bid to take out the MMI Three Ports yacht race starting on October 29. 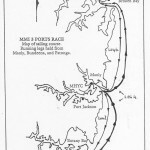 The Three Ports race an unusual concept, organised by Middle Harbour Yacht Club, involving 117 nautical miles of sailing and 54 km of running divided into three legs over two days. 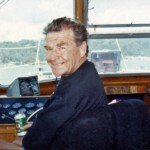 Apocalypse skipper Barclay Wade. 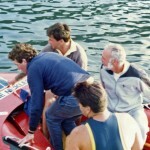 a sculler at the 1984 Tokyo Olympics, has snared the talents of runners Mike Lawson and Greg Brown in a bid to take out his third successive Three Ports race. 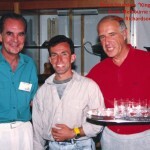 This race is such a variation to long ocean racing because it involves short hops and the thrill of waiting for your runners to return." Wade said. "It is gruelling for the runners who have to run 54km in all but it's fun for the crew because we stop in between and have a party." Lawson, a former South Australian welterweight champion, sailed aboard Apocalypse last year and will this year team up with Brown, a former basketballer. 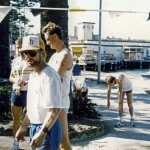 Brown switched to biathlons after retiring from basketball five years ago and earlier this year took second place in the Australian Biathlon Championships in Canberra and fifth place in the Australian Ironman Triathlon at Forster. The pair. who are chasing the King of the Mountain title for the fastest run times, admit their biggest concern in the race is sea sickness. 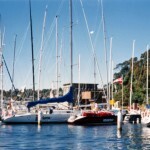 The adventure begins at Manly with a 10km run to Middle Harbour Yacht Club where the two runners meet with their yachts, which then race 24nm to the Basin at Pittwater. 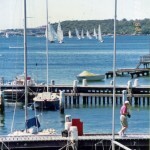 The runners are put ashore for a 12km run and on returning the yachts race 65nm to Bird Island, off Lake Macquarie and then south to Patonga on the Hawkesbury River. 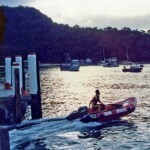 The final running leg involves a 32km dash through the Brisbane Waters National Park before the yachts race 24nm to the finish line at Middle Harbour Yacht Club. 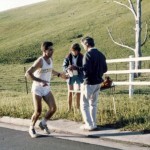 "You do this race because it feels so good when you stop". Wade said. 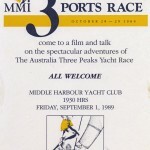 The MMI 3 Ports Race starts on Saturday at 8.00 am with a 9km run from Manly Wharf to Middle Harbour Yacht Club followed by a 20 nautical mile sailing leg from Middle Harbour Yacht Club to Port Hacking. 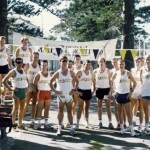 The runners alight at Bundeena to compete in a 14km run through the Royal National Park before joining their yacht to then race 35 nautical miles, via a 'gate' in Sydney Harbour, to Patonga in Pittwater. 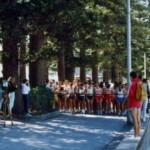 At this point, all entrants will have the chance to join an evening of festivities, to rest, inspect sore feet and savour the thought of the final challenge of racing back to Sydney. 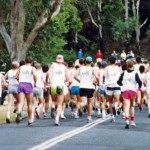 On Sunday, the runners will line up to compete in a gruelling 30km run around the Brisbane Waters National Park. 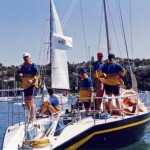 They will then join their sailing team for the final leg, the 22 nautical mile race from Patonga to Sydney Harbour. 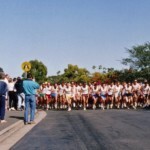 Prizes will be awarded for the overall fastest team, overall place-getters on elapsed and corrected time in each Division and the fastest running aggregate elapsed time and Veteran runners. 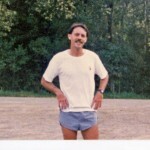 Runners that compete in all 3 running legs, there is the prestigious King and Queen of the Mountain awards. 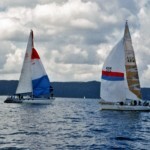 RUNNERS: "the two preventer backstays, Ied from the masthead to each quarter of a sailing yacht, which support the mast when the wind blows from abaft the beam. On each occasion of going about.... the lee runner is overhauled to allow the boom of the mainsail to swing over.... the weather runner being set up taut to take the strain on the mast. " 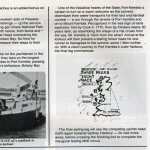 - extract from the Oxford Companion to Ships and the Sea, Edited by Peter Kemp, 1988. 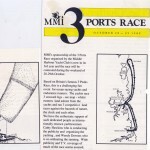 For the running competitors in the 1991 MMI 5 Ports Race, who have not sailed before, hearing the call "throw the runner off" or "we don't need the runners on this leg" could rightfully feel some concern for their future well-being. 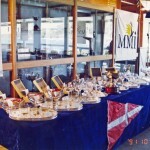 However, what they will ultimately experience over the Weekend of the 26th and 27th October is the excitement of competing in a unique sporting event that combines both coastal bush running and blue water racing and presents one of the few occasions in which fully crewed monohull and multihull yachts have the opportunity to compete side by side. 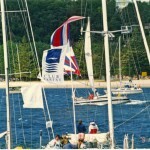 Each yacht can carry a minimum crew number allowed under their rating rule, plus two runners who must be aboard the yacht for all the sailing legs. 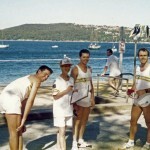 Some yachts will utilise their normal crew as runners for this gruelling event, proving that not all yachties are unfit. 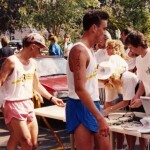 Other entrants have already organised their runners from 1990 to again join the team. 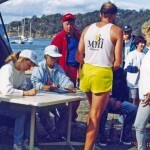 Those entrants that do not have runners organised will be allocated runners by the MMI Race Shore Co-ordinator, Wendy Downes, from Middle Harbour Yacht Club. 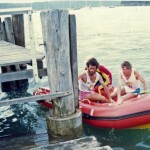 Bill Allen, owner of Otago, will for the fourth year in a row have as his yacht's runners, up to four of his regular crew. 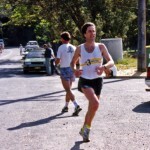 Two of those crew, Graham Love and Robert Yeldon, competed recently in the Blacktown Marathon and will go on to compete in the Honolulu Marathon in December. 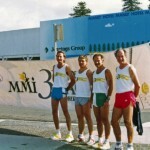 "Other runners from our crew are Denis Williams and Michael Bonhote. 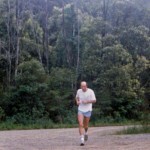 If necessary, I can also run one of the legs, but I tend to leave my shoes at home just in case my crew decide to nominate me for one of the longer running legs I" Allen reports. 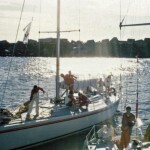 Musto Physical Challenge (ex Freight Train) will be skippered by one-armed Phil Thompson, who after competing on Amazon for the Sydney-Southport race then flew to the UK and competed in the Fastnet Race. 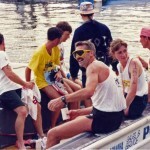 Thompson will be leading a crew of disabled sailors and runners. Three of those crew will be travelling from England. 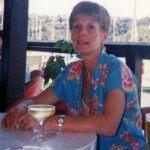 Selection of this crew has been based on sensory and physical handicaps which do not require any form of medication. 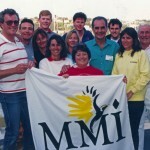 Thompson plans to utilise the MMI Race as a training ground for Physical Challenge, Australia's disabled crew entry in the 1995-94 Whitbread Around the World Race. 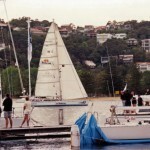 Andiamo, Seahawk, Infinity, Star Ferry, Group Therapy, Mercedes IV, Crocodile, Emma, Margaret Rintoul II and Superoo. 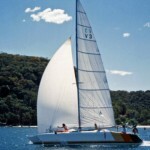 The Multihull division is expected to again have a strong showing and indications are that a fleet of over 70 yachts will compete this year. Entries close on October 5th with late entries accepted up to October 19th. 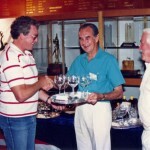 Pittwater yacht Buckle Up, took out overall honours in 1990 with the s ortest combined running and sailing times for the six stage race. 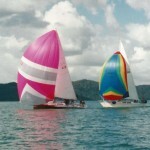 Class honours went to; IMS - Haupia, IOR - Brunnhilde, Arbitrary 1 Rock 'N Roll, Arbitrary 2 - The Pink Boat, Multihull - Superoo. 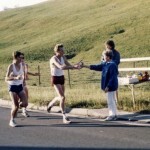 The top runners in 1990 were Brian Morgan (Madame De Farge) followed by Geoff Large (Baguette) and Ken Rauchpach on Brunnhilde. 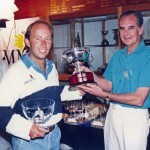 Line Honours went to Musto Physical Challenge (ex Freight Train) skippered by Phil Thompson. 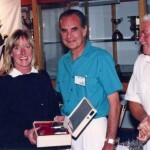 1991 3 Ports Race - Bruce Saunders "King of the Mountain"
1991 3 Ports Race - Joanne Cowanne "Queen of the Mountain"
Yes, its on again - 24/25 October, 1992. For all those who keep coming back for more and those who want to try it for the first time, we are anticipating a bigger and better event this year, although last year's will be hard to beat - exhilarating sailing and perfect running conditions. 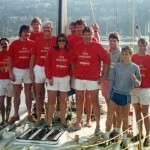 Line Honours last year went to Musto Physical Challenge (Amazon) skippered by Phil Thompson, skippering a physically handicapped crew. 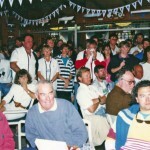 From just 9 entrants in 1987 to 65 in 1990 and 1991, this race is second only to the Sydney to Hobart in the number of yachts to race out of Sydney Harbour, becoming a prestigious event and high on the priority list of sailors and runners alike. 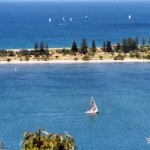 Starting from Port Jackson with 77 nautical miles of sailing and 54 km of running over 2 days the vent takes in the beauty of Port Hacking and Broken Bay, Royal National Park and Brisbane Waters National Park. 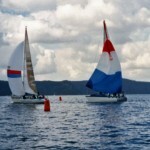 Three sailing legs and 5 running legs are involved with 2 runners from each boat completing each leg. 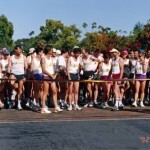 Some runners complete all 3 legs whereas some only 1 or 2, depending on the number of runners on board. To enter you will require a current Rating Certificate (IOR, IMS, JOG or PHRS) and AYF Cat 5 Safety certificate. 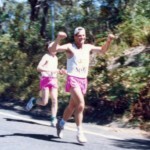 Don't despair if you can't find your own runners - we can do this for you.